University Archives & Special Collections (UASC) in the Joseph P. Healey Library at the University of Massachusetts Boston is pleased to announce that six collections of previously unavailable archival material are now open for research. This is the first of a series of posts to announce newly available collections, toward the goal of making all of UASC’s collections, both processed and unprocessed, open for research. Collections that have not been processed, or that are minimally processed, will be made available upon request to researchers in approximately two to three weeks, depending on the size and complexity of the collection. Contact library.archives@umb.edu for more information. To learn more about the collections that were made available this week, click the collection title in the list below. A New Place: A Narrative Photograph Exhibit of the Southeast Asian Refugee/Immigrant Experience, 1993: “A New Place: A Narrative Photograph Exhibit of the Southeast Asian Refugee/Immigrant Experience” was donated to University Archives and Special Collections in 1994 by Richard Lee Sheehan. Materials consist of photographs, personal narrative, and poems documenting the experience of five University of Massachusetts Boston students and one staff member, all Southeast Asian refugees or immigrants. 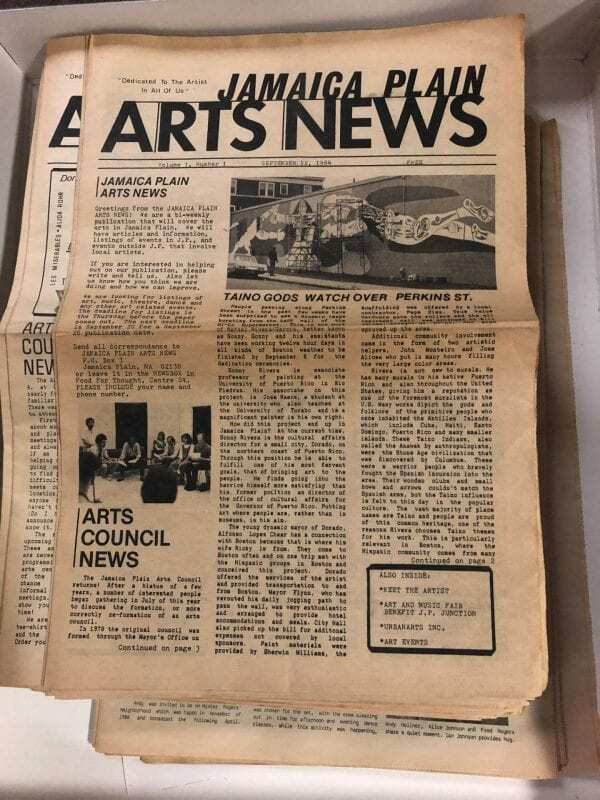 Jamaica Plain Art News collection, 1984-2000, bulk 1984-1999: The Jamaica Plain Art News collection was donated to University Archives and Special Collections in 2000 by Helen Hummel. The collection includes a full run of Jamaica Plain Art News and the records of the organization, as well as records related to the Jamaica Plain Art Council and the Footlight Club. West family of Nantucket collection, 1860-1964: The West family of Nantucket collection was donated to University Archives and Special Collections in 2006 by Adele H. Ames, a descendant of the West family. The collection contains historic photographs (including nineteenth-century daguerreotypes) of African American residents of Nantucket. Additional items are West family photographs and newspaper clippings, collected historical items, and several personal and business-related items. Roland Geist scrapbooks, circa 1930-1950: The Roland Geist scrapbooks were donated to University Archives and Special Collections in 2015 by Lorenz Finison. Roland Geist was a bicycle historian and collector during the 1930s and 1950s who compiled the scrapbooks in this collection. Geist, originally from New York, was active in cycling organizations and bicycle events. Schlesinger Library peace movement newsletters collection, 1892-1997: The collection of peace movement newsletters were donated to University Archives and Special Collections in 1998 by the Arthur and Elizabeth Schlesinger Library on the History of Women in America, a research library at the Radcliffe Institute for Advanced Study at Harvard University. These collection documents the publication output of various peace movement committees and organizations, mainly in the Boston area. Massachusetts Department of Conservation and Recreation (DCR) Vietnam Movement ephemera, 1969-1971: The Vietnam Movement ephemera of the Massachusetts Department of Conservation and Recreation (DCR) was donated to University Archives and Special Collections in 2019 by Sean M. Fisher, DCR Archivist. The items in this collection were found by the Massachusetts Department of Conservation and Recreation (DCR) in a review of the files of a former (and deceased) staff photographer who had a life-long personal passion for New England coastal defense military history, and personally collected in this subject area. This collection documents part of the anti-Vietnam War movement in the Boston area in the 1960s and 1970s. For questions about these collections or to schedule a research appointment, please contact library.archives@umb.edu or 617-287-5469. This entry was posted in Announcements, Collections, Special Collections, University Archives and tagged archival collections, finding aids, finding aids for all. Bookmark the permalink.